Exploring a new food culture can be an adventure for some, and intimidating for others. Even if one can read Japanese product labels at the supermarket, deciphering what is inside the package is not always so easy. I have been eating Japanese food for almost four decades and I still find myself scratching my head trying to make sense of it all. Along the way, though, I have come upon a few delights that I would be selfish not to share. Explore and enjoy! Being curious can be a good thing. Miso offers itself in a myriad of ways, beyond the ubiquitous miso soup. The dressings that can be whipped up, or conveniently purchased, are also addictive. I like to keep kinzanji miso in my fridge as a savory dip for crudités of cucumbers, carrots and daikon. Kinzanji miso has a heady, sweet aroma and a chunky texture. It is a healthy alternative to creamy vegetable dips. Su miso is a blend of sweet saikyo miso and vinegar, and is commonly found as a dressing over quickly blanched dark greens, or with blanched octopus. This puckery, slightly sweet dressing can brighten up many dishes. A salad composed of lettuce, carrots, tomatoes and wakame seaweed with this dressing makes for a refreshing side dish. I like the conveniently packaged su miso by Marusan. Take some along with you for your hanami picnic. Something missing in Japanese food is heat. The Thais and Koreans have more than their share of spicy food—we have wasabi and karashi. So in my pantry you will find a jar of yuzu kosho. This thick, salty paste is simply yuzu, chili peppers and salt. You will find both red and green versions, depending on the color of the chili peppers. It is a great garnish for yakitori, steamed vegetables, udon or as you please. Chef Josh DeChellis of Sumile in New York City suggests putting yuzu kosho on fresh scallops and then lightly sautéing them in a pan. Nori is the crispy seaweed found wrapped around maki sushi rolls or some onigiri. There is a variety of nori available on the market. 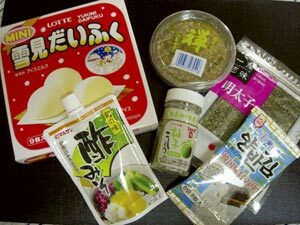 The non-flavored type is used for sushi; flavored, or aji-tsuki, nori is used with traditional breakfasts. Traditional Korean nori is quite irresistible with salt and sesame oil. For a real treat, Yamamoto Noriten (available at Takashimaya) has nori flavored with offerings such as uni (sea urchin), ume (plum), mentaiko (spicy cod roe) and salmon, to name but a few. It makes a great alternative to potato chips for a healthy snack. Fu, a delicacy from Kyoto that is also a staple in vegetarian diets, is a form of wheat gluten—it is literally pure protein. Fu is either dried or nama (raw). The dried version does not have much flavor, but like a dry sponge it will soak up the liquids in which it is immersed. You’ll find rehydrated fu in sukiyaki or in a simple bowl of soup. However, it is the nama fu that makes a great, healthy snack. On a recent trip to Kyoto, I picked up two decadent flavors of nama fu, bacon and cheese. The nama fu can be lightly sautéed in a non-stick pan, without oil, for otsumami with beer. OK, “fish cakes” may not sound appetizing; however, anything that is deep-fried should not be overlooked. Another great snack or side dish is satsuma-age, fish cakes that have been deep fried. Most likely you have seen this in the oden case at your convenience store. Some satsuma-age can be eaten at room temperature, just slice and indulge, but I prefer to quickly sauté them. At shops which make them by hand you will find a variety of stuffings, from traditional gobo (bamboo roots) to more modern fillings like corn and cheese.